We love oobleck. After our first time making it, even after doing many other experiments, Preston suddenly declared that science is his favourite part of homeschooling. Win! Oobleck is a non-Newtonian fluid or liquid. Under pressure it behaves like a solid. But remove the pressure and it turns to liquid. The stuff is bizarre, and crazy, and completely mesmerizing. It combines science and sensory play into a perfect experience for all ages. Although we have made it a few times, this last time we wanted to pump up the experimental value a bit and create our own oobleck science experiment. We decided to try two different recipes for making oobleck and compare the results. The first batch we made with dish soap, it is sometimes called Bubble Oobleck. It started out looking like a promising oobleck but it very quickly became a paste and lost it’s non-Newtonian qualities. My little dragons quickly lost interest as the textures they love with oobleck simply didn’t hold up with this recipe. See? This is after about ten minutes of play, it no longer became solid under pressure. We made a second batch with the same results. The good news is that clean up was a lot easier since it was half dish soap. There were bubbles everywhere! If you want to give it a try, this is the recipe we used for the dishsoap oobleck. Maybe you will have different results? If you do, please report back so we know what to try differently. Thanks! Mix together using your hands. Have a helper on hand to add more cornstarch if it is too runny, or more dish soap if it is too dry. You will feel when it is ready. It will become solid when you squeeze it, then run like goopy liquid when you release the pressure. We also made a batch of our regular recipe oobleck, and as usual it was a huge hit. Each time we make it Jackson and Preston make new discoveries and observations. This time Jackson noted that when he balled up the oobleck then threw it into the bowl it hit the other oobleck like a solid on solid, before slowly melting into liquid again and mixing back in. Both boys enjoyed placing it under pressure, tearing it, then letting it ooze again. Jackson also discovered he could make sculptures with the oobleck if he worked it quickly by throwing and flicking. It was pretty cool to watch. It stacked up almost like magic. Check out the middle image to see what I mean. 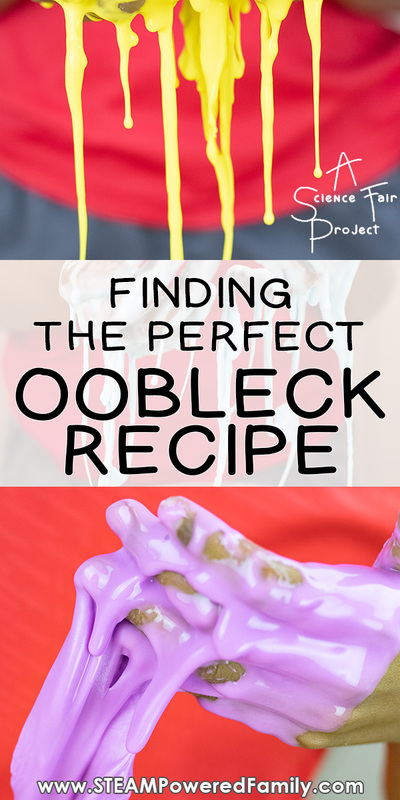 Oobleck Recipe – The one that works! 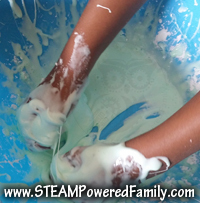 Mix the cornstarch and water together with your hands so you can feel when it is all mixed and ready to play. Again it will become solid under pressure, then liquefy when pressure is removed. It helps if you can have a helper ready to add a little water or cornstarch if you feel it needs it. 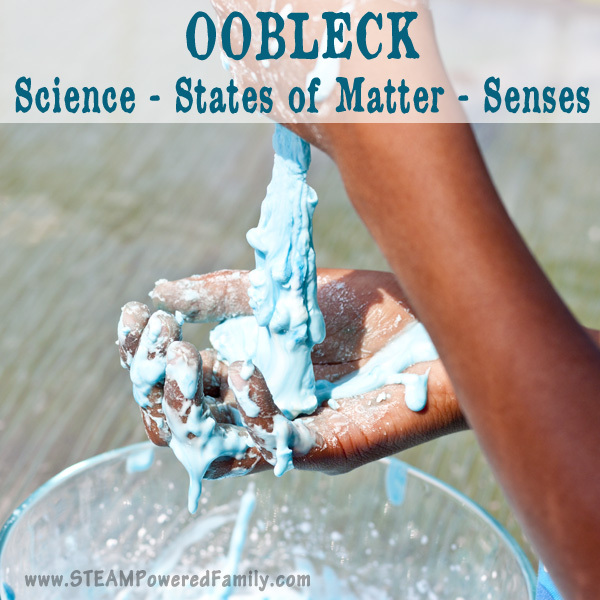 Coloring your oobleck is simple, simply add food coloring during the mixing process. My little guys played with this for over an hour and the oobleck was still going strong. They really love this stuff. It is fascinating. Try slapping it, and it stays solid! NOTE: Never put these recipes down the drain or you will get a BIG bill from the plumber. Do it outside if possible, or make sure the area is well draped. Cleaning up this stuff is crazy tricky. When I tried to brush it up it turned powdery and into solid balls, but the second you stop trying to clean it up, it turns to liquid and oozes everywhere… including into the cracks of my hardwood! I warned you, this stuff is crazy weird. ~ We use this experiment to discuss states of matter. Preston loves the immediate relationship between solid and liquid. He requires a lot of repetition to retain concepts and oobleck provides a wonderful opportunity to practice liquid versus solid. ~ Jackson is learning how not only temperature can affect states of matter, but how pressure and force can also affect a matter’s state. ~ Jackson is also reading a biography on Issac Newton. So we discussed Newton’s theories around fluid dynamics, and why this is a non-Newtonian liquid. Plus, we had some great discussions about the life of this amazing scientist. ~ Oobleck is also a wonderful sensory experience. It seems to really fill a need for my kids when it comes to their sensory diet. 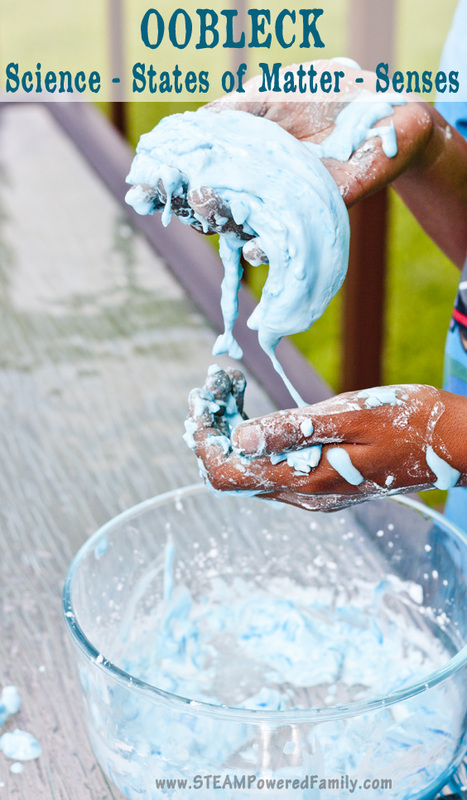 So next time the kids are bored, whip up a batch of oobleck and let them learn by gooing! It is an amazing science activity that should be in your toolbox for keeping the kids busy this summer. We couldn’t stop at just this one oobleck recipe. We decided to dig deep and test a bunch of different ingredients to see how it affected our non-Newtonian Fluid and the results SHOCKED us! There is an even better oobleck recipe. Check out our investigation to see how all the ingredients did and which one was the clear winner. More Oobleck Projects That Will WOW! Color Changing Oobleck – Check out this video! The Ultimate Stretchy Slime That Actually Works!